There is a perfect partner for everyone. These days, many people use online dating sites to find a special person. 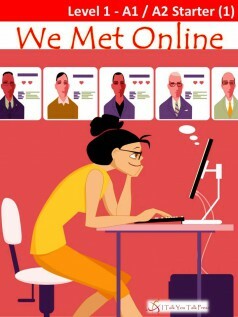 In this book, there are six stories about people looking for love online. Peter lives in the countryside. He doesn’t have the chance to meet many women, so he tries online dating. He has dates with three women, but does he find love? Sue finds Kevin online. She is so happy. Kevin is so romantic! Sue is sure he is the perfect man for her. Everything is wonderful, until she goes to stay at his apartment for the weekend… Rebecca and Joseph meet online. They go on a date and Rebecca enjoys it very much. Joseph is charming and seems to like her a lot. After the date, she sends him emails, but he doesn’t reply. Maybe he doesn’t want to be her boyfriend. Or maybe there is another reason for his silence… Enjoy these and three more stories about love and dating!